Today’s boil-water advisory issued by OWASA in the Chapel Hill / Carrboro NC area gives us the timely opportunity to examine this topic. This same event happened back in February of 2017 as well, effectively mandating that all residents of the Chapel Hill / Carrboro NC area drink bottled water for 1.5 days. A “boil-water” advisory is a warning issued by government officials in coordination with health authorities. It is an order issued when the municipal water supply is potentially contaminated by pathogens. The water could be contaminated with Escherichia Coli (commonly known as E. Coli) which can cause an array of nasty symptoms like diarrhea, urinary tract infections, respiratory illness, and pneumonia. Another common scenario that could cause a boil-water advisory is a water main break. A water main break usually causes a drop in water pressure. While this doesn’t mean that the water supply is contaminated, the break does make the system susceptible to contamination through the broken pipe. What Should I Do During a Boil-Water Advisory? DO NOT drink the tap water. It could be contaminated. 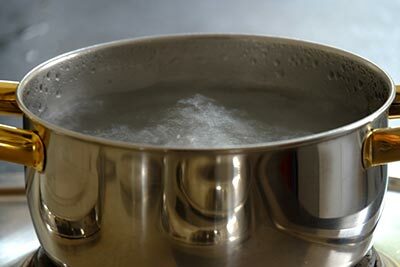 At the minimum, you should boil all water intended for drinking to a rolling boil for at least one minute to ensure that all protozoa, bacteria, and viruses are killed. Is There Anything Else I Can Do to Protect Myself during a Boil-Water Advisory? We at A&T Well and Pump always recommend having a backup water supply. Storing bottled water is OK, but it can get expensive. A more cost-effective option is storing water yourself. BPA-free water jugs and containers are sold in stores and online, and larger containers up to 275 gallons can be purchased. If you don’t have the space for these water storage options, another option is a product called the WaterBOB which uses the space in your bathtub to create a clean, BPA-free water storage. After all, your bathtub may not be something you want to drink out of! Yet another option is filtering water through an extremely high-quality water filter. We are NOT talking about the water filter in your fridge or a Brita filter — instead, you need water filter designed to take water from a questionable water source like a stream and make it OK for drinking. Sawyer makes water filtration products capable of this level of filtration. If I Have a Private Water Well Do I Need to Worry About a Boil-Water Advisory? No! One big advantage of having (regularly tested) well water is that it is a completely different source of water from the municipal water supply so if you have one you can effectively ignore the water-boil advisory.